All eyes this year, however, South Korea's mobile maker Samsung's flagship Galaxy S10 series rests on. But let's tell that the company is also working on the new Galaxy M series. Galaxy M10, M20 and M30 can be dropped under the Samsung Galaxy M series. 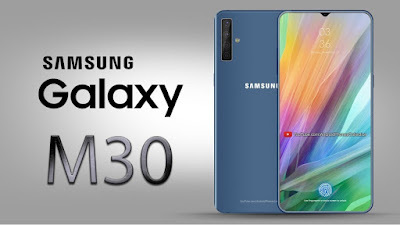 After Samsung Galaxy M10 and M20, the specification of the Galaxy M30 has now leaked. Galaxy M30 smartphone's specifications are leaked by All About Samsung. Leaked information has shown that triple rear camera setup can be given for photography in Galaxy M30. Like the Samsung Galaxy M20, this phone can also have a 5,000 mAh battery. The concept of Infinity-U Waterdrop display in the Galaxy M30 has been reflected in Concept Render (a picture made from graphics). The phone will have 6.38 inches (1080x2220 pixels) display, triple camera setup (13 megapixels and two 5 megapixel sensors) and 16 megapixel selfie camera. Its dimension is 159x75.1x8.4 millimeters. According to the old report, it will come with the Achenos 7885 processor, 4GB RAM, Android 8.1 Orio and 64GB / 128GB storage. Some time ago the specification of the Galaxy M30 was also listed on the Gebank benchmark website. The listing revealed that the Acneon 7885 chipset can be used in the handset. In a recent report, it has been said that the company can launch the Galaxy M Series's three smartphones in India this month. But no official statement from the company has come out right now. OnePlus 5 and OnePlus 5T will be available today from Android Pie Update, users will find these new features.